This trilogy is a great introduction to the excellent Bernie Gunther series by Philip Kerr - one of the best hardboiled police/crime series I have read for a long time. It is extra special because the series is set with meticulously researched historical detail in Nazi Germany before and after the war and is seamlessly integrated with some of the key happenings and powerful personalities of that time. Bernhard (Bernie) Gunther is a hard-boiled Berlin detective who served eleven years as a homicide detective in Kripo (Berlin's criminal police) and left in 1933 when the National Socialists started to purge the force of all non-party members. He becomes a private investigator and then is forced back to Kripo by the Nazis. After witnessing mass killings he fights on the Eastern Front and becomes a POW with the Russians. MARCH VIOLETS, set in 1936, has Gunther investigating the murder and torching of the daughter and son-in-law of a powerful German steel magnate and an associated safe robbery. The investigation gets mixed up with Nazi issues and Bernie gets involved with Goering (in a cameo role) and Reinhard Heydrich, the prime architect of the Holocaust. THE PALE CRIMINAL, set in 1938, has Gunther forced back into Kripo by Heydrich to find a serial killer of Aryan teenage girls who are Nazi sympathisers. A GERMAN REQUIEM is set after the war in Berlin and mostly in occupied Vienna. Bernie is asked to help a former colleague and black marketeer accused of the murder of an American officer. In the process he gets dangerously involved with both the "Amis" and the "Ivans" in Cold War tensions and with some major war criminals. 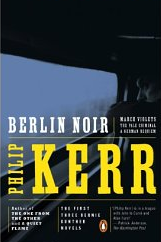 Philip Kerr is a first class thriller author who can write heavily-plotted, hard-boiled and frequently violent crime novels seamlessly set against a fascinating background of Berlin before the war and Vienna after the war. This is wonderful stuff for a crime-fiction junkie like me who loves his doses of history with a crime-fiction background. This is the first time that I have read through a trilogy without a break and I really enjoyed all of the books - highly recommended. I am hooked on reading the rest of the series very soon.